Omg you guysssss have you been lurking the Renfrew top as hard as I have? 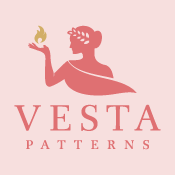 I was seriously excited when Tasia released this pattern – I love working with knits and I want everyone else to love them, too! Honestly, I already have a tshirt pattern block and I’ve got a pretty good handle on knits – not to toot my own horn or anything, but I’ve been pumping out knit tshirts/dresses for a few years now (mostly LLADYBIRD stuff. But I bought this pattern anyway – for SCIENCE. Despite making hundreds of tshirts, I’ve never actually sewn with a pattern for knits. So I was curious to see what it was like, and I wanted to report back to y’all. Also, SCIENCE. I was a little confused with the finished measurements – they include a few inches of ease, which is guess is necessary for a stable knit. 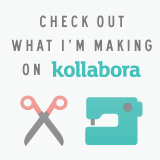 Me, I use super stretchy knits – I have a whole cabinet full of them! I cut my pattern to accommodate for this – a 4 at the bust, reducing to a 0 at the waist/hip. I left the sleeves at a 4 (I have big upper arms for my size, I guess) and the shoulders/neckline are a 0. I also reduced the shoulder width just a hair past 0 as my first prototype was in danger of falling off my shoulder. Speaking of my first shirt, I’m not going to show it to you. There’s nothing wrong with it – the fit is great – but it’s a boring red long sleeve shirt with a scoop neck. BORING. Who wants to look at that? I do have one small change I made to the pattern that I think makes a huge difference with the finished neckline, though – if you are sewing this up with a stretchy/slinky knit (i.e, not something stable), cut the neckline band an inch or so shorter than the pattern piece indicates, and then stretch it to fit as you sew it on. The ending result is that the band shrinks down to fit the neckline and you get a perfect curve without needing to top stitch it down. As far as how much to cut off – well, I wish there was a formula to tell you, but it’s really dependent on how stretchy your knit is. Usually an inch is enough, but you might need to experiment! It is definitely worth it for the end result, though. The fabric requirements on this pattern, btw, can easily be fudged. If you play around with the cutting layout, you can definitely save on fabric. Fabric can also be pieced at certain points if you don’t have enough length – this particular shirt is pieced right down the front. Partially to form the chevrons, but mostly because I barely had any of this stripey fabric. I tried to get a picture of my top stitching but you can’t really see it, even with my super obvious ‘shopping 😦 Instead of using the zig zag (which I think looks kind of amateur on knits), I used a double needle and stitched with the seam in the middle of the needles. This is something I see on lots of RTW and I think it looks pretty professional! The bobbin stitch in a double needle is kind of a zig zag, so you still get a little stretch even though the top stitching is straight 🙂 I also did this with my shoulder seams when I stitched down the twill tape. ← The Big Reveal – The Fabiani Coat! Oooh! Love how you used your fabrics! 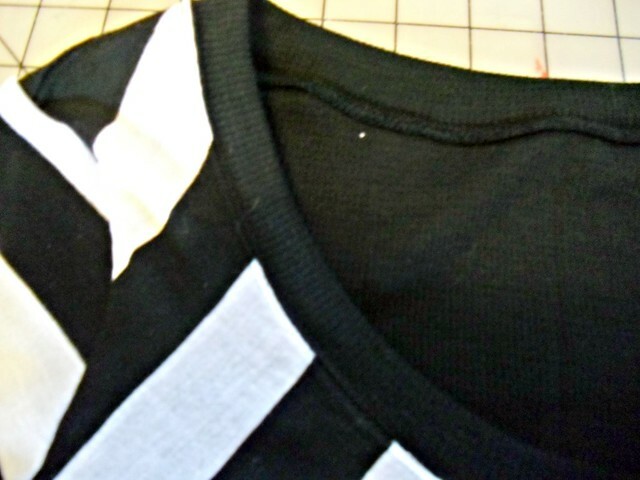 The chevrons are divine, and I love, love, LOVE that the back is all black. It makes the profile look divine. It looks very awesome! Sometimes having not enough fabric is a good thing – you may not have ended up with the fabulous chevron effect with plain back otherwise! Couldn’t be cuter, and I love the double-needle top stitch tip! Big thanks! Darling Renfrew- it’s magic! 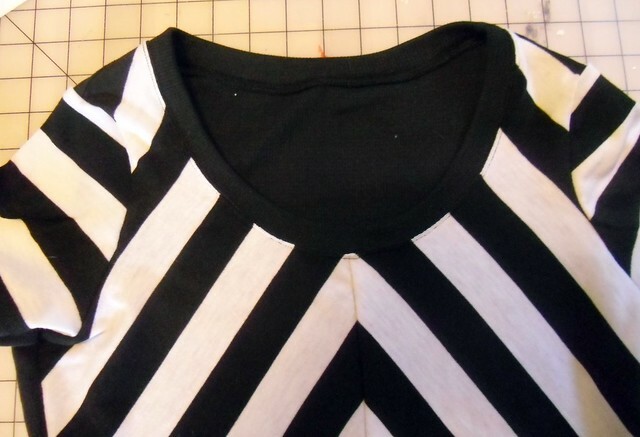 Also have to say, that is a super cool use of stripes & screams “super skilled serger”! I am impressed by the exactness of the chevron meeting, do you baste or do you have another clever trick? I am also grateful for the double needle tip for the neckline – I was thinking only of using it at hems, & now you have this other gift of experience. Is it a silly question to ask if you use ballpoint double needles? I bought my double needle ready made. AM I being incredibly thick- are they removable? Gosh I’m demanding and hard work today!!! I didn’t baste at all – I just pinned the fabric at the top of each chevron, and then stretched the fabric to match up as I serged the seam 🙂 My knit fabric is a 4 way stretch, but even 2 way stretch has a tiny bit of give! Yes, I have a ball point double needle that I use with knits. But I had to order it online, as my local stores don’t carry the ball point kind. Well I am super impressed because my matching & serging is not that hot! Thanks for the info though, and about the double needle thingy – I dont know if they make ball point doubles, but am dying to try this approach out as it looks so professional. Thank you for making me feel not so dumb!! Wow! I predict there will be some secret shameless rip-offs of this! I always think constraint/limited resources inspire creative solutions, and this is definitely that. I love the chevron! Was it tough to mach the stripes with the knit, either with cutting out or stitching? I might have to pull out some stripes and copy you. Haha, I totally use the zigzag stitch. And yes, I totally am a nit amateur, sigh. But it’s okay, I know that somehow, someday, the double needle and I shall be friends. I even have one, I’m just afraid of it. It’s scary. But I got this pattern in the mail on Thursday, and I just can’t wait to make it! I have some stripy fabric and maybe chevrons would be the way to go…..
Knit, not nit. Oh, god, struggle. Usually, if you cut the neck band 75-80 % of the neck opening, it will do the trick. I’m pretty sure there are ball point double needles too, if you use that or a universal needle (which is has a slight ball point) there’s no risk of the needle punching holes that might get bigger after a while. I love it, a great way to use striped fabric, so stylish. Love this top! Awesome job! I love wearing knits, but I haven’t mustered up the courage to try to work with them yet. And maybe this is a stupid question – but can you get a decent looking knit garmet with just a sewing machine? Or is a serger necessary? 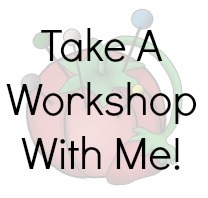 I would consider doing a tutorial if there is interest! What kind of tutorial do people want to seeee? Unfortunately, I’m pretty useless when it comes to using knits on a sewing machine (I’ve always had the serger!) but maybe a tutorial on altering the pattern or something?? 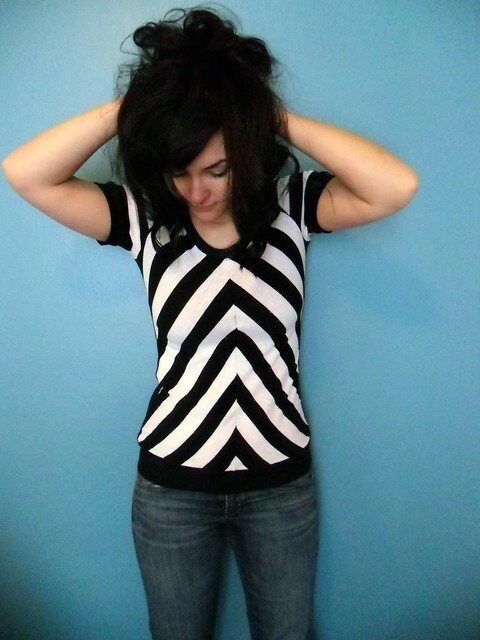 I love the stripes just being on the front- so cool- lovely fit, too. Oh man, I was going to pass up the renfrew top because it looked a little vanilla for me, but your version makes me want to take another look. It’s adorable and so you. Gah! I love this! It’s just so fabulous! I’m dying over the stripes and how clever of you to use the black in the back! It really looks great on you, not to mention I’m loving the fit for you. I’m so excited to try this out – I might just have to steal your stripes here! I’m so in love! I love, love your version of this top. I have it currently on my table ready to be done. I have very limited experience with knits so having a first go with some jersey remnants. That is an absolutely inspired interpretation of the top. 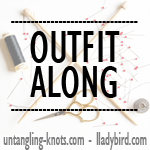 You are sewing up a storm, lady! And you work, too?! What a great blog. A beginner like me has found it very informative. I will invest in a double needle in due course and follow your tips. Thank You. Your top looks fab. Okay, now I am seriously considering buying this pattern. I wasn’t too interested in making a knit top when I can get a basic knit tee at Target for $5, but all of the knit tops I have made so far have facings which I do not like. But I’m digging the neckline finish on this and I want to try it! oh gosh, again, how stinkin’ cute are you?! really loving the chevron awesomeness. Now I am really wanting this pattern!! I love your version! I have the pattern and just picked up some fabric. It’ll be my first knit so now I just need the walking foot and I think I’ll be ready to go! This is such a fun top! 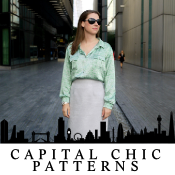 It definitely shows how versatile the Renfrew pattern is! 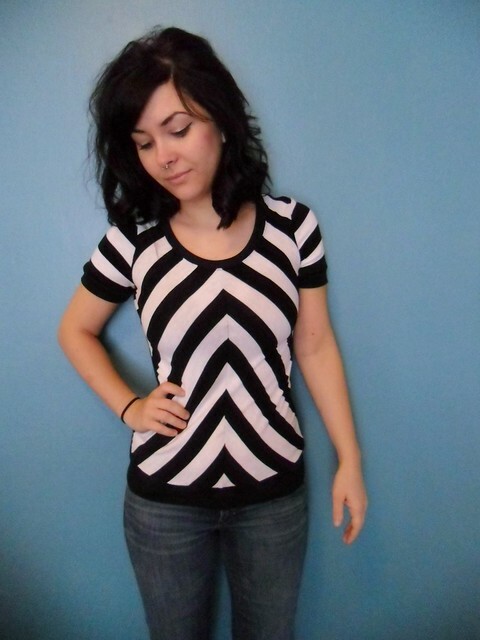 I just love your version with the chevron front and plain black back. I have a love/hate relationship with knits – I love wearing them, but – even despite my serger and walking foot – I kinda hate sewing them – they scoot all over the place! Love, love, love it!! So classy and fun and flattering!! Where did you get the fabric (I struggle to find good stripe knits)? I did buy a lovely striped jersey at my local fabric store – the stripes are about half as wide, and they are navy and off-white. It was $15 a yard, though, eep! Thanks so much ($1/yard!!!! – wow!)!! Oh I love your chevron front and plain back! I am sure there will be a few of us knocking off your design!! He, he, lucky I am in Australia so we won’t bump into each other!! Lauren! Everything you make is awesome… I would totally wear that shirt every single day. 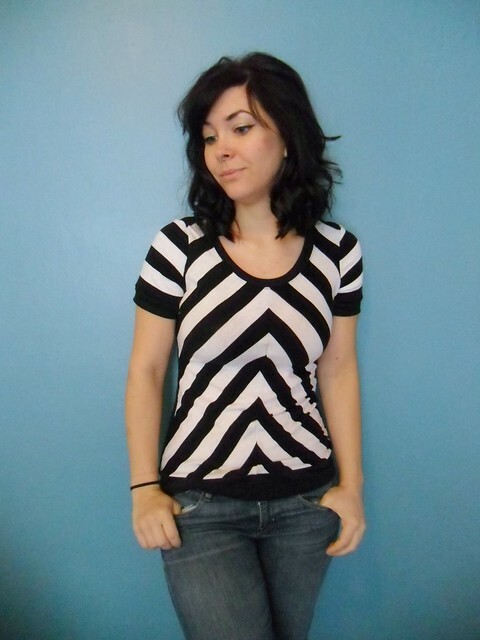 Love chevrons, love black and white stripes! 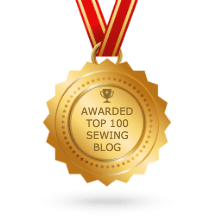 Your sewing repertoire is simply amazing, and your willingness to share your experiences with all, but I think the most helpful of all are your abundence of comments regarding your specific pattern alterations/adjustments, just so very very helpful indeed, so thank you Lauren. GAH!! This is so beautiful! I ordered the pattern as soon as it was released too but haven’t had time to sew anything yet… you just motivated me to scour the fabric store tomorrow for something to whip one up this weekend. LOVE the chevrons – it’s so bold and POW! Will look lovely with bright colored accessories 🙂 Awesome! It is crazy that not until this post had my brain connected that you were the same girl whose knit dresses I used to stalk on Craftster! Duh! Your tee looks great! Haha, aw, yeah, I’m an old craftsterer! The chevron is excellent! I normally just fold the fabric over at the neckline, and finish with a double ballpoint needle. But your tip about using the double needle across the band and the edge of the main bodice looks so cool. I just bought the Renfrew pattern so now I’m definitely going to try that. Thanks! Ooh I can but there’s not really much to cover – it’s not like fitting a woven, where there are darts and ease and all kinds of adjustments. The knit just stretches to accommodate. Which is why I love it, of course 🙂 I’m going to try to put together a knit/Renfrew post soon, though, since it seems to be a pretty popular point of discussion! I’m going to have to my copy ordered. I have seen some really nice renfrow’s so far, but yours takes the cake. Wow, you did a great job, very professional looking and well fitting. It looks awesome! I love the chevron effect going on. I wish I wasn’t deathly afraid of knits though. Oh my god, I want your shirt! Yet another thing to go on my to-sew list, hee. I only really heard of the renfrew top this last week, would NOT have assumed that was one, since everybody seems to be doing the cowl necked ones. That is just fabulous looking on you! This made me laugh because I did the same thing with my first attempts at knit necklines! I tried putting tiny darts in them too… yeah, that didn’t work either lol. The secret is in the stretch! I have been wondering about this pattern too as haven’t yet bought anything from Tasia and have seen a lot of this one around blogville. Great idea to use the fabric the way you have – love the chevrons and black back. All good. PS gorgeous blue coat from earlier post too – with wonderful BOLD lining. Just lovely.